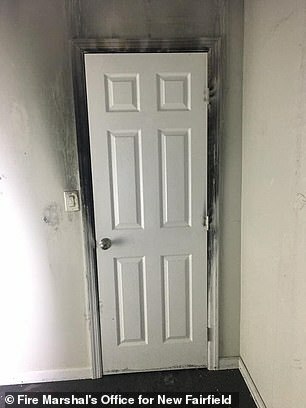 Firefighters in Connecticut have shared a disturbing pair of pictures to highlight why it is so important to sleep with the bedroom door fully closed. In late January, the local fire department in New Fairfield, Connecticut responded to a house fire that caused significant damage. 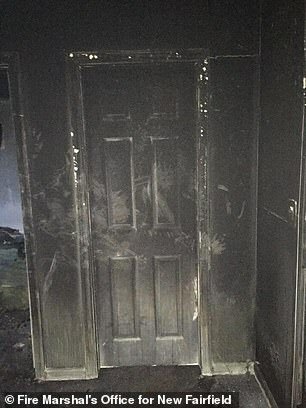 But while smoke and flames scorched the outside of one bedroom door in the home, leaving it black, the inner side of the door was left almost completely undamaged — illustrating that simply closing a bedroom door at night could be life-saving. 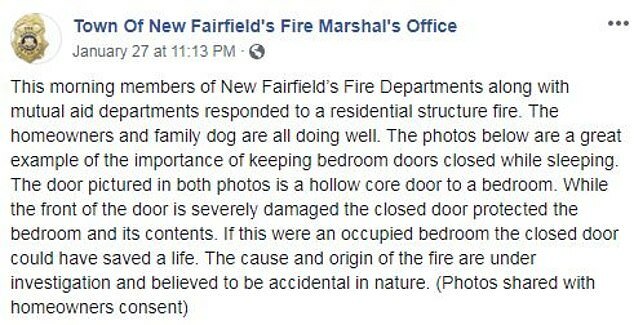 The images were posted on Facebook by the Town Of New Fairfield's Fire Marshal's Office. 'This morning members of New Fairfield’s Fire Departments along with mutual aid departments responded to a residential structure fire,' the post read. 'The homeowners and family dog are all doing well. 'The photos below are a great example of the importance of keeping bedroom doors closed while sleeping. 'The door pictured in both photos is a hollow core door to a bedroom. While the front of the door is severely damaged the closed door protected the bedroom and its contents. Sure enough, the smoke damage certainly began to creep into the room, and can be seem around the door frame. But the still-pristine white door did a wonderful job keeping most of the smoke back. Though actual flames could eventually burn down a wood door, many fire-related deaths and injuries are actually caused by smoke inhalation. According to the NFPA, only five per cent of deaths in fire are due to burns alone. Forty one per cent are due to only smoke inhalation only, and 13 per cent are due to both smoke inhalation and burns. Days later, the Cold Spring Harbor Fire Department in New York shared the story, too. 'As a parent it’s hard to convince little kids to sleep with the door closed, they always want it open just a little,' their post read. 'I do a lot of fire prevention at schools, so one thing I try and stress to the kids is, how important it is to sleep with the doors closed. The two posts have since been shared thousands of times teach, and commenters chimed in. 'I close my door so the ghosts don't come in my room but glad to know there are other benefits!' joked another mother named Katy Boula.